As I am writing this, I am currently working on my third batch of pickles. I’ve been buying cucumbers from the farmer’s market and making all kinds of pickles, although garlic dill is definitely my family’s favorite. Pickles are just such a tangy and refreshing treat! This is my first summer to try canning, drying, and freezing enough food to put away for the rest of the year. Last summer, I did some canning, but nothing more than a handful of jars. So a few weeks ago, I bought a big boiling water canner, eagerly anticipating all the lovely jars full of a bountiful harvest. 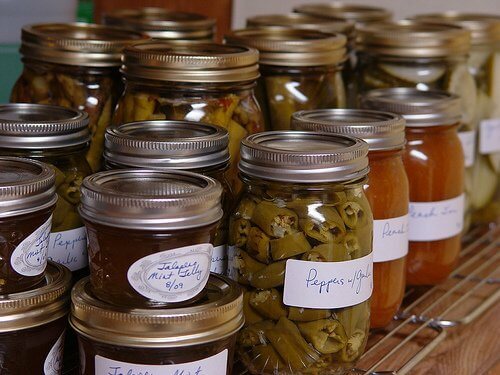 To me, jars full of all different colors of food are like artwork on the shelves of my pantry. But, alas, when I finally got around to using the water canner, I read the fine print. Apparently you aren’t supposed to use it on a glass cooktop, which, of course, is what I have at my home. In my effort to improvise, I ended up boiling the water for the canner on the gas grill on my back patio. I have four kids of my own, and then two foster sons, so with six kids in my house, I don’t have much time to do any canning while the kids are awake. So, I found myself getting around to boiling the water on my grill at eleven o’clock at night. As I was sitting out there in the dark waiting for the pot to boil (which it finally did after about an hour), I was getting eaten alive by mosquitoes and had June bugs crawling all over my feet. The warm thoughts of my lovely jars making artwork on the shelves of my pantry quickly faded. The thrill of being a good steward and providing healthy food for my family year round disappeared. I became cranky. Afterall, it was late—even my husband was in bed at this point—and I was hot and being eaten by bugs! But it was there in the dark and humidity that God taught me a valuable lesson through those jars of pickles. 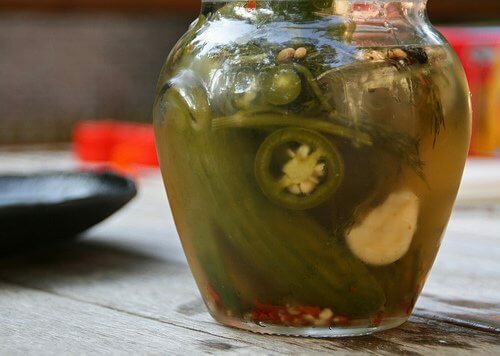 Pickles can be sweet and crisp and delightful for those who partake, but only with that valuable (although time consuming) step of processing the jars. Without processing the jars, any impurities that are left inside will putrefy the pickles and leave a stinky and poisonous result. The same is true in our hearts. How often have we cried out for mercy, wondering how long the Lord will let us go through a trying time in our life? I know. I’m there now. I’ve been there for a little over a year now—always asking God to intervene and rescue me. But just like my pickles, I need the heat of suffering in my life for the proper amount of time—the time that God deems necessary. Suffering and trials in our lives gets rid of those impurities in our hearts—those impurities that cause the disease of sin to spread through our lives if left unattended. If we want to have our lives be a sweet aroma to the Lord and be refreshment to others, we must accept the trials that God allows us to experience. And most importantly, suffering produces endurance in our lives, much like processing my jars gives them a long shelf life. Oh, how I want my life to be refreshing to others—especially my children! But I must be refined. I must allow the heat and the pain because my heart is full of dirt. I must admit that many days, my words are more like the stinky pickles—hurtful to others. But the hard times in life clean that out and refine us when we turn to the Lord. I started making pickles with a heavy and complaining heart, but just as always, the Lord was faithful to encourage me with something as simple as a few jars of pickles. I think it is so neat how God does that—how physical things around us mirror a much deeper reality in our hearts. And I hope, too, that what God showed me that night can be an encouragement in your life as you wait for the water to boil as you can your food this summer. How has the Lord used difficult times and painful trials in your life to refine you and cause you to turn to Him? Great post! Just wanted to let you know, I have canned on my glass top for 5yrs. and its still fine! I don’t know what I’d do if I wasn’t able to can. Planning on canning 2 bushels of peaches this week! yummo! I’m going to remember this good advice every time I eat a pickle now! You can can on a glass top but there is the possibility of scratching happening to the glass top. Thank you Beth, this was so well written. What a great illustration. It is humbling to realize again how small we are in the sight of our great God, yet he takes the time and has infinite love to ‘process’ us through this life. I had the same problem when we moved to our new house – I bought a two-element portable range at Wal-Mart for $20, and just use that on our counter when I need to can. Good for you for finding a deeper meaning in the struggle, though. God teaches us His truth in so many little things, doesn’t He? Thanks for sharing such a wonderful reflection on God’s working in our lives. Regarding canning, I have a glass cooktop and you can use a large tall stainless steel pot to can and it works fine. I have been doing that for years. This year, I bought a pressure canner from Walmart that has a flat bottom and can be used on glass stovetops. The key is the flat bottom. It works great as a water bath canner as well. Thanks again for the great reflection! OH how true! I’ve been facing trials constantly for the past 8 years – but God has stretched me and grown my faith and obedience to Him in ways I never thought possible. Loved this post and how true it is if we keep our eyes open! I think I tend to miss the little lessons God tries to teach me and so then He has to whollop me to get my attention. Thanks for the reminder to look for the lesson in pickles! I use my glass top stove all the time to can. However, it is slow. We invested in a camp stove that gets that water bath canner boiling in about 15 minutes. Also, I use a stock pot to water bath can when I am making pints or small jars like that. I put several jar rings (tied together with twisties) in the bottom of the pot and put the jars on that. It gets to boiling much faster. hth! Thank you so much for your words of encouragement during these trying times. It’s amazing how God can use others to verbalize what we’ve been feeling. Just wanted to say thank you for this wonderful post. I have been wanting to can for the first time so I decided to read about it first. This post couldn’t have come at a better time for me, God is GREAT! He works in funny ways, but he works. I will never eat a pickle in the same way again, b/c I will always remember the work that goes into it and let that remind me of myself. This story is what I have recently started to call ‘God Moments’. Someone told me this year to write them down on a sheet of paper and put them in the front of your bible for the times you need encouragement.